Even though the title of this CD reissue is Neuf Songes (Nine Musings), there are thirteen. 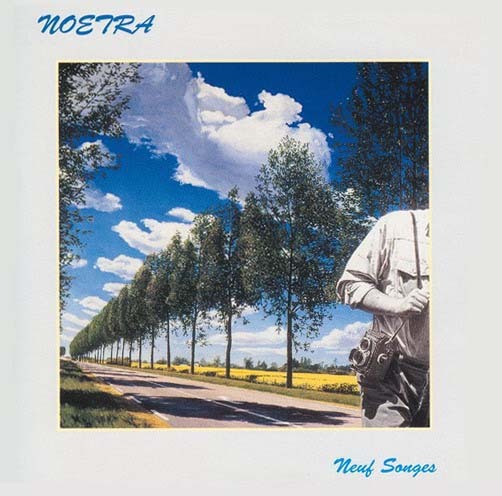 Noetra recorded these thirteen thought provoking “musings,” one to ten minutes in length, between November 1979 and August 1981. Noetra, a large ensemble, featured: Jean Lapouge (composer, guitar), Christian Paboeuf (flute and oboe), Daniel Renault (drums), Denis Lefranc (bass), Pierre Aubert (violin), Pascal Leberre (clarinet and soprano sax), Francis Michaud (tenor sax and flute), Denis Vollet (cello), Claude Lapouge (trombone), Jacques Nobili (trombone), and Laurent Tardif (alto flute). Noetra successfully straddled the interface between rock, classical chamber music, and jazz without creating background music or falling prey to avant garde excess. Neuf Songes reminded me of the album Un Certain Pays by another obscure French band Human. Both bands created a unique blend of these musical styles. If bands like Art Zoyd, Third Ear Band, and Universe Zero stimulate you, but you prefer music a bit more in the mainstream, then Neuf Songes is for you. This is fabulous, very intricate and occasionally dark, somewhat Canterburyish kind of stuff. The pieces are mellow and rolling as well as intense and energetic, the writing is excellent, and there is over 70 minutes of great music on this Musea CD. The instrumentation is based around a beautiful clean electric guitar, delicate and tasteful drumming, bass, violin, and oboe/flute with a bunch of other strings and woodwinds helping out. At some points it veers towards a 20th century classical style, where the drums drop out and there is some great woodwind and string polyphony, but for the most part the drumming and bass keep the music moving along at quite a palatable clip for most prog listeners. This album creates the same mysteriously peaceful kind of feeling I get from Laurent Thibault, and also at times reminds me of the group Oregon. The Canterbury component of the sound is kind of a mix of early Henry Cow, Hatfield, and National Health, though you shouldn't get the impression that Noetra goes off on "Dreams Wide Awake" type jams. The intensity on Neuf Songes is created by the wonderful composition, dynamics, and controlled dissonance.